One of the unique things about my school is that clinical experience is interwoven into the entire program. My clinical rotation started the second week of the first semester, rather than being introduced later into the program. We started out with two eight-hour days in the radiology department and three inside the classroom. That lasted for two semesters. Now that I’m in my third, we’ve upgraded to three clinical days and only two classroom days. While that means a lot more experience for me, it also means that I’m on my feet a lot more. There isn’t a lot of down time when you’re juggling outpatients, inpatients, ER patients, and fluoroscopy exams. At the end of the day my feet were less than pleased—specifically my heels. But it wasn’t until my two-week surgery rotation that I realized the shoes I was wearing weren’t cut out for the demands I was putting on them. The pain from my feet started radiated up to my knees and lower back. In surgery, radiographic technologists usually stand in the operating room until the surgeon needs an x-ray. There isn’t always a place to sit, and as a student I usually let the lead tech enjoy that luxury if it’s available. There were times when I wanted to excuse myself from the OR just to go stretch or sit for a moment, but I didn’t want to miss out on anything important or seem unprofessional. 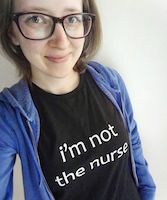 Seriously, if a nurse or a surgeon can stand for the operation, so can I. But they had better shoes! 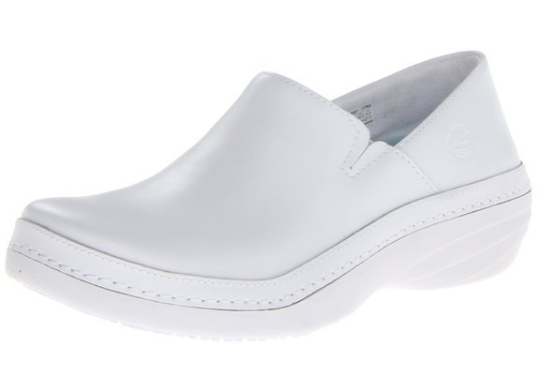 As a student, we have to wear white leather shoes, which really limits our choices when out shopping. Trust me, I would much rather wear my running shoes. So at the end of my surgical rotation I set out to find a new pair of clinical-appropriate shoes. 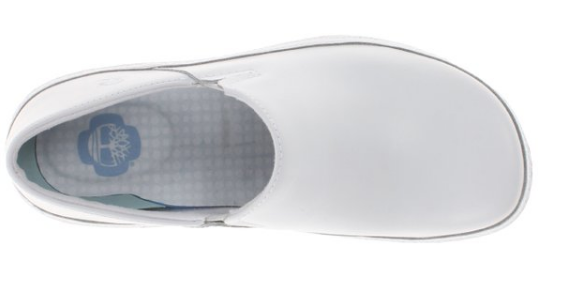 I had bookmarked these Timberland PRO Women’s Renova Professional Slip-on shoes a while back. The price tag just didn’t meet my student-friendly budget. But I was desperate. I talked with friends and classmates and they all told me that splurging on shoes, especially since I’m on my feet so often, is totally worth it. So I did. And I wish I had done it sooner. The breaking in process was a little annoying. While my heels didn’t hurt as much after a full day at the hospital, my ankles were sore from the sides of the shoes rubbing against them. This has subsided a lot after a few weeks of wear, but it’s something to consider. I recommend breaking them in at home before taking them out for a full shift. They do squeak a little when I walk, but it’s a small price to pay for comfort. Other than that, I’ve been very happy with my purchase. They’re non-slip, breathable, and easy to clean. If you’re a healthcare professional in need of a change, I definitely recommend Timberland PROs. Yes, spending $120 on work shoes might seem like a lot of money, but it’s well worth it. Foot health is important, and if you’re a student, you’ve got a lot more long days ahead of you! Be kind to your feet. Side note: The company didn’t ask me to review the shoes, so all opinions are my own. Computerized Tomography (CT) is one of the most important developments in diagnostic imaging over the past 50 years. It creates virtual slices that allow doctors to see inside the human body without having to make an incision. Unlike x-ray, CT is able to visualize soft tissues—more importantly, bleeding within those soft tissues. This is critical in trauma cases because CT scans can provide an incredible amount of diagnostic information in an extremely short amount of time. Every second counts when someone’s life is on the line. But enough with the radiology lesson! Today in my Imaging class I learned a really interesting fact about the history of CT machines: The Beatles actually contributed to its creation. Now The Beatles weren’t actually moonlighting as physicists or engineers, but their crazy success allowed Godfrey Hounsfield to invent the CT scanner. Hounsfield was a researcher at Electrical and Musical Industries (EMI). You might remember EMI as the record label that signed The Beatles, but in the 1950’s it was actually an industrial research company. Long story short, when the band was signed to the label in 1962, Hounsfield was given permission to conduct independent research with the funding from The Beatles’ insane success. With that funding, he was able to invent the CT scanner, which EMI released in 1972. 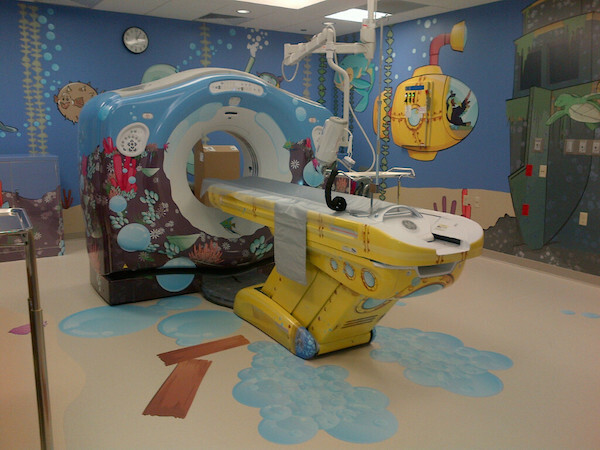 What’s even cooler is that Lurie Children’s Hospital here in Chicago has a “Yellow Submarine” themed CT scanner in honor of The Beatles’ contribution. It’s just one of the many fun-themed rooms at the hospital, but it’s certainly a memorable one! So there you have it. Feel free to share this fun fact with the Beatles fans in your life! Our school participated in a Christmas tree decorating contest earlier this month. 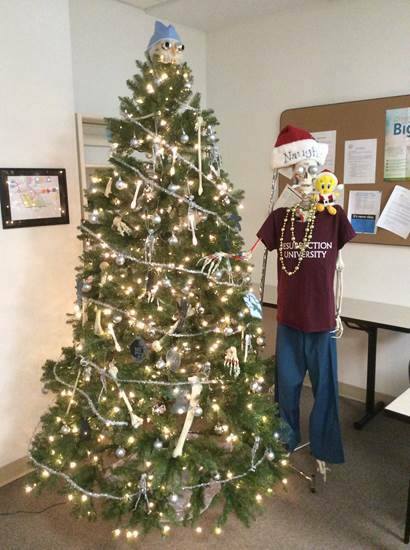 A classmate had a brilliant idea for our tree’s theme: bones! We took bones from a skeleton and turned them into ornaments. One of our clinical instructors cut out x-rays, which are a bit difficult to see in this picture, but trust me they’re awesome. And who needs a star when you have a skull? Whoa. It’s been a while, huh? I thought that I’d have more time to write over the summer, but I ended up playing video games and making a third trip back to the Kennedy Space Center. Remind me to start writing more about space. Maybe this blog will have a dual focus: anatomy AND cosmology! School is currently underway, and it’s more intense than I anticipated, but that’s okay because I appreciate a good challenge. We’re only three weeks in and I feel like I’ve already learned a lot. I’ve even seen some really cool procedures during my clinical days—right now I spend three days in the classroom and two days in the radiology department. On my first day of clinicals, I watched a swallow test. It was a fluoroscopy exam, which means that the x-ray was taken in real-time so I could see what the structures of the mouth and throat looked like in real-time. Not a bad way to start off the semester! I found this video of a swallow test on YouTube in case you’re curious. Since then I’ve had the privilege of observing radiation therapy, CT, and a special procedures case in which a balloon was inserted into the vein of a patient’s arm. All of this is in addition to general radiography (x-rays). By mid-October I should be taking my first chest ray! Also, I’m really looking forward to checking out MRI and my eventual rotation through surgery. As for classes, I’m really digging radiation protection because it’s very science based. It lightly touches on the physics behind it all, and I can’t wait until we dive in completely in our upcoming physics class. I wish that I were enjoying my anatomy class more. This semester, we’re devoting an entire class to the skeletal system and its anatomy/physiology. It’s off to a slow start, so hopefully I’ll reignite my interest in the coming weeks. The only downside is that I’m having a difficult time managing my time. It’s hard to balance my school workload with that of my job. Sometimes I feel like I’m barely keeping my head above water. I need a better system, but I’m working on it. Speaking of, I should probably get back to studying! Last week, I had to take the Health Education Systems Incorporated (HESI) exam. This was part of the admissions process for the BSIT program I’m applying to. I had a lot of anxiety about it despite having studied for two weeks leading up to it. I don’t know about you, but standardized tests — specifically ones that have a significant impact on my future — make me panic. This is especially true of anything involving math. In the past, I found that sometimes singing to myself before starting an exam helped calm my nerves. It was a simple way to trick my brain into thinking that the end of the world wouldn’t be prompted by turning my exam over. But unlike your run-of-the-mill exam, the HESI covers more than just one subject. It includes algebra, anatomy & physiology, biology, chemistry, grammar, physics, reading comprehension, and vocabulary. The majority of my recent classes have been biology-based, so I felt very overwhelmed when I began preparing for my exam. As it turns out, all that panicking was pointless because I ended up scoring very well on it — I got a 94%. So I thought I’d share some of my study tips to help out anyone else who might be stressing over their upcoming exam. 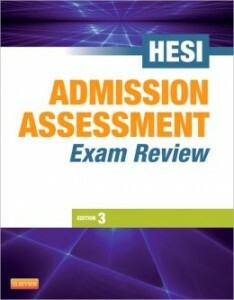 The Admission Assessment Exam Review, 3rd Edition was recommended to me by the woman proctoring the HESI at my school. I foolishly ignored her suggestion and instead found a cheaper option on Amazon. I ended up buying this book and I was really disappointed. Not only were there formatting errors, but there were significant typos and errors in the grammar, algebra, and biology sections. So yes, you might spend $10 more than you’d care to, but the quality of information you’ll receive will be infinitely better. I know this because a classmate bought the first book and was much happier with it than I was with my budget-friendly purchase. The HESI A2 Exam Prep iPhone app really came in handy when I was on the go. Rather that lug my prep book on the train with me, I was able to continue studying on my phone. While the app itself is free, it’s really limited. You’ll want to spend the $10 on the in-app purchases to unlock all of the subjects. From there you’ll have access to more than 1,000 practice questions and built-in study reminders. Another reason the app is helpful is that it’s similar to how the actual test will be given. The HESI is a computerized exam, so studying from a paper prep book can sometimes throw you off. Don’t worry — you’ll be given plenty of scrap paper. Eight subjects seems like a lot, but you might not be required to study all of them. For my exam, I was tested only on algebra, biology, grammar, reading comprehension, and vocabulary. Knowing this ahead of time, I was able to tailor my studying habits so I could focus on only the most important sections. Save yourself some grief and ask questions early. Don’t waste time trying to teach yourself physics if you don’t need it. I found that it was really helpful to study with two different people: one who understood what it was that I was studying and one who didn’t. This allowed me to review and practice the material in different ways. Studying with someone who understood the material came in handy when I didn’t fully grasp concepts. I could ask him questions and get detailed explanations. The latter came in handy later on when I wanted to make sure that I understood what I had learned. If you don’t believe me, try explaining the stages of mitosis to someone who’s never studied it before. If they understand what you’ve described, then you have a really good handle on the mechanism. Of course this won’t work for every section, but I found it particularly useful for biology and vocabulary. To be clear, I’m not recommending that you ignore the practice tests. My advice is that you don’t fill in the answers to the practice questions in your book. Doing so will make it difficult to re-take the test since your answers will be visible. Erasing won’t help either. You won’t be able gauge how well you’re understanding the material if hints are clearly marked. Furthermore, if you’re feeling really good about most of the questions, don’t keep repeating them. Save yourself some time and instead of repeating the entire test over and over again, just focus on the ones you got wrong. Then, once you’ve mastered those questions, retake the entire test one more time. Although taking the practice test at home is much different from the actual test, it’s in your best interest to time yourself. The HESI exam has a four-hour time limit. That probably seems like a lot of time now, but it flies by — especially if you’re being tested on all eight of the subjects. Time your practice tests so you go into your real exam with an idea of where to start and how much time each section will eat up. During my test, we couldn’t go back to previous questions. We had to answer each one and submit each answer. You’ll need to spend a bit of extra time on some of the questions since you can’t come back to it later. Timing yourself ahead of time will ensure that you’re able to give yourself some wiggle room during the exam. If you’ve studied, the only thing left to do is relax and trust that you’ll do well. You know this stuff. Take a deep breath and begin. Good luck! It looks like plans are changing, again. The program I’ve spent the last two years working toward has changed from certification to a full bachelors degree. As a result, a last-minute pre-requisite was added and the tuition increased five-fold. It seems, from where I’m standing, that the curriculum will stay the same and the only thing changing is the piece of paper I’ll receive after two years. To me, that doesn’t justify the price hike. It’s disheartening to say the least. A friend told me that it seemed like the universe was putting up road blocks because it had something else, something better perhaps in store for me. I didn’t believe her at the time, but a few weeks later I had a conversation with a mentor of mine and he told me about a pathology assistant program that I might be interested in. I had no idea that this existed, so I’m very excited about the possibility of enrolling. Pathology is more along the lines of what I’m interested in, since Medical Examiner was my initial goal. The downside, at least for right now, is that I need a bachelors degree to be eligible for the pathology program. Bummer. So I’m looking into a bachelors of science in biology at a nearby university. If I can finish that in two years or less, and spend significantly less money on tuition in the process, then I will strongly consider that route. I’m just not sure I’ll enjoy two years in biology more than radiography. Unfortunately, I won’t have enough information to make my decision for another couple of months. Until then, I’ll continue researching options and try to keep my spirits up. I don’t do change very well and when everything is out of my control I get itchy. The good news is that I’m almost done with my current semester and I will graduate in less than two months. Counting down the days! Unrelated, I dug out some of my favorite anatomy and medical-related books from storage this past weekend and I can’t wait to tell you all about them! Stay tuned. I learned an important lesson this past summer: don’t start a new blog while taking calculus. Over the summer semester — which is eight weeks long by the way — I took Anatomy & Physiology I and pre-calculus. I followed that up with Anatomy & Physiology II and calculus in the fall. Hence the lack of posts on this here blog. My A&P courses were fantastic, and I can’t wait to share some interesting fun facts and study tips with you all. Calculus, on the other hand, was a nightmare. I’m not mathematically inclined, but two semesters of calc helped me discover a new-found appreciation for algebra. Oh, how I miss solving for x! But I’m not here to rant about sine and cosine. Consider this my warm-up post. I hope to spend a lot more time writing here in 2015, especially since I’ll (hopefully) be starting a brand new bachelors program in August to become a radiography technician. In the meantime, tune in soon for posts about autopsy seminars, must-hear medical podcasts, and more!